My paternal Harrison family has seen me reach back to my 7x Great Grandparents, Francis Harrison and his wife Ellen Aspland from the fenland village of Little Downham, in Cambridgeshire, England. At the time of Francis' marriage to Ellen in 1739, he is noted in St. Leonard's Church parish register as 'Francis jun', suggesting that there was an older Francis Harrison from which he needed differentiating. It is currently unclear as to whether this was his father, uncle, grandfather or another older relative. Francis and Ellen become parents at least six times during the 1740s. There are many generations of the Harrison family in Little Downham, appearing countless times in the church records, and the family have worked the agricultural land surrounding the village for generations. There's also a few nineteenth century Harrison family headstones still standing in the churchyard, and many more recent additions in the cemetery nearby. 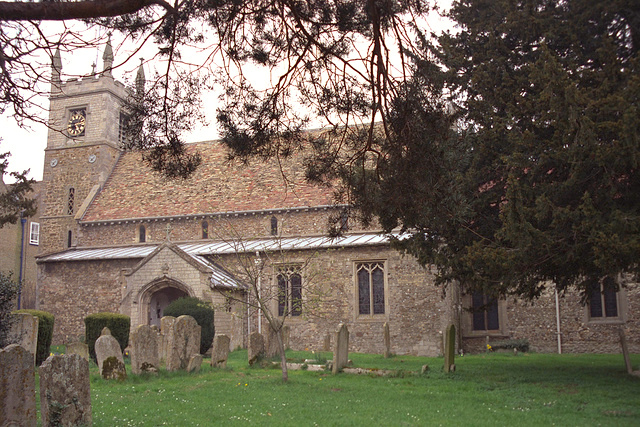 Above: St. Leonard's Church in Little Downham would have been very familiar to the Harrison family. Photo: Andrew Martin. My own Harrison branch ends, when my 4x Great Grandmother, Fanny Harrison married my 4x Great Grandfather, shepherd Robert Tingey in 1820. Fanny was one of eight children - seven of which were daughters, and therefore resulting in my closest Harrison surname branch almost vanishing from the records through their marriages. One of Francis and Ellen's sons, William Harrison married a Margaret Granger sparking a long-running Harrison family tradition of calling a male child Granger Harrison, which began with their second son in 1766.